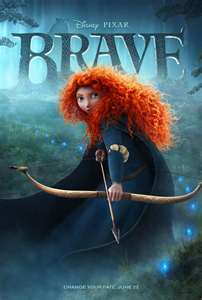 In Disney’s latest animated blockbuster, “Brave”, the movie’s heroine Merida is described as “impetuous” and “determined to carve her own path in life.” She defies her parents and the custom of her day in order to determine her future’s course. Because it had been promoted relentlessly, my whole family could quote lines from the movie before it was ever released. And my son has a knack for imitating other people’s voices and accents so every time the movie trailer comes on TV, Scott says in a thick Scottish accent, “If ya had the chance to change your fate, wud ya?” I’m laughing now as I write this because I just had him come say it for me and it cracks me up every time. There was a time in my life when I was very much like Merida. I was free-spirited, independant and believed I was in control of my destiny. And just as the impulsive red-headed Merida, I would make rash decisions based on my emotions. Although I believed I was in charge of my destiny, I spent little time considering the consequences that the choices I was making would have on that destiny. And many times, just like Merida, my hasty, emotional decisions unleashed chaos in my life. Today the idea of trusting in myself and attempting to control my own fate is something I want no part of. The old “been there, done that” comes to mind and believe me, where I was going and what I was doing was was not working. Back then, the way I figured it, the outcome of my life was inevitable and I didn’t hold much hope that is would be a favorable one. But I thought that I, alone, could change that fate – I honestly believed I had the power to change the course of my life. But what I didn’t know then was that as long as I continued to live in sin, the course my life was taking would never change and I lacked the ability to change it no matter how hard I tried. The other problem with thinking I had the power to change fate was that I didn’t take into account my impulsive nature and my emotions that always got in the way. So even though I tried hard, things seemed to be headed toward the fate I thought I had the ability to alter. I had put all my trust in myself to overcome the hand that I had been dealt. But after several poor choices and their negative consequences, I began to believe that I really didn’t have any control over my fate and my life was spiraling toward the end result I had once believed I had the power to change. It was fifteen years ago when I reached my rock bottom and I decided it was time to quit trying to run my own life. I had messed it up to the point that I had almost lost my marriage, I was in debt, and I had no hope for the future. It was in those darkest moments I realized that I really was in control of my fate – only it was definitely not in the way that I had imagined. I finally understood that in my attempt to control and thus change the course of my life, I was actually steering it in the exact direction I wanted to avoid. And I can now see that if I had continued, my life would have turned out just like I had come to expect it to. 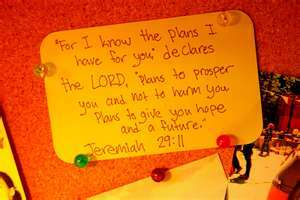 But thankfully God had a different plan for my life. He had created me with a destiny and a hope. But until I surrendered control to Him and sought His will for my life instead of my own, I would never reach the pre-ordained, perfect destiny He created me for. What I learned in that difficult and challenging season of my life was that my fate was still dependant upon my choices. But at that point, I made a choice that would put my destiny in God’s hands, not my own. My future would no longer be dependant upon a predetermined outcome influenced by my choices, my circumstances, my family history, or what someone else negatively spoke over my life. It would be based on my faith and trusting in God’s promises for my life. In the spring of 1998 I chose to surrendered my life to Christ and began to put my trust and my faith in Him to determine the course of my life. 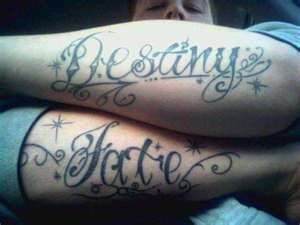 Fate implies an inevitable, usually unfavorable outcome. I learned the hard way that when you believe in fate you are saying that your life course cannot be changed and there is no hope to overcome your wrong choices, your mistakes or your misfortunes. The course has been set and you’re living each day moving toward an unavoidable conclusion. You may believe you can change your fate but as young Merida and I both discovered, taking your fate into your own hands only produces chaos. While there are those who are able to temporarily alter their fate by the choices they make, they will never be able to change the final outcome when they choose to live in sin. The bible says the wages of sin is death. If we choose sin over God our fate will always be eternal death (Romans 6:23). Our fate is ultimately determined by our unwillingness to surrender control of our lives. But God alone determines our destiny. But when you live by faith, you are not affected by circumstances, past mistakes and wrong decisions. 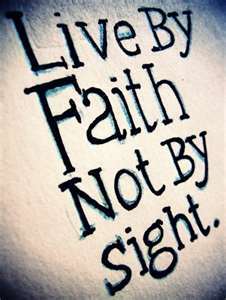 Faith is the confidence in what we hope for and assurance about what we do not see. (Hebrews 11:1). Faith is not based on our negative thoughts or how things appear to be going in our lives. Faith means we are trusting that God is in control even we we cannot see the evidence of it. And when your faith is in Him you have hope in a destiny He predetermined for you, one that will have a great and noble end. If ya had the chance to change your fate, wud ya? Your answer should be a resounding YES! The first step is coming to the realization that you are not in control, God is, and that you are in desperate need for Him to be both Lord and Savior of your life. And while He does give us free will to make our own choices for our lives, our choices will never lead us to the destiny we were created for. We will simply become overwhelmed and frustrated as we hurdle toward a fate we were never intended to encounter. The next step is to surrender your life to Christ and to put your faith and your trust in the One who determined your destiny long before He ever created you. No outcome you can imagine in your wildest dreams will ever compare to His good and perfect will for your life. So break free from the burden of trying to determine your own fate and let God lead you into your destiny – your life will never be the same!